Ancient Alaskans were buried at the Nuvuk site north of present-day Utqiagvik for hundreds of years. An ancient site on the shores of the Beaufort Sea, once home to the northernmost community in Alaska, is helping unlock secrets about people who lived in the Arctic a thousand years ago. The site, known as Nuvuk, which means tip or point, was an ideal spot for hunting and whaling and researchers believe it was occupied continuously for a millennium until the end of the 19th Century. 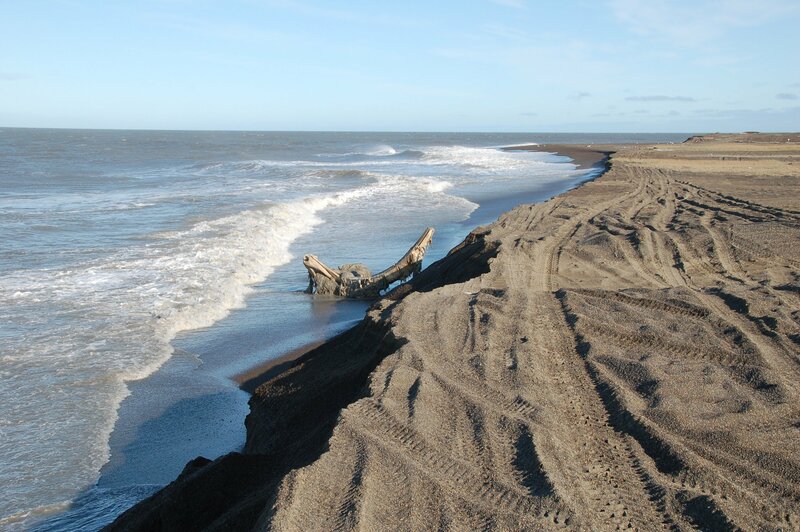 That’s when beach erosion on the gravel spit and the building of Western facilities at what is now Utqiagvik led to its abandonment. About 20 years ago the deteriorating bluffs north of Utqiagvik began exposing a forgotten Nuvuk graveyard that had been used for hundreds of years, triggering a process to relocate dozens of graves to a protected site inland. Recognizing that the erosion would continue and alarmed by the loss of human remains from waves and wind, the community decided that a more secure resting place was needed. Community elders agreed to twin goals that continue to guide the process. One is to treat the human remains with respect, while the second is to allow careful scientific bone analysis to fill in some of the unknown details about ancestors of the Iñupiat. “The number of graves encountered and the dates indicate that Point Barrow specifically and the North Alaskan whaling area in general were not backwaters in the development and spread of Thule culture,” wrote Anne Jensen, an anthropologist in Utqiagvik who did her doctoral dissertation on the cemetery. So far, 85 graves have been unearthed from the site, making it the largest Thule cemetery ever excavated in North America. The Thule people were predecessors of the Inupiat and are believed to have migrated eastward from northern Alaska about 800 years ago. A new study of genetic material taken from 39 individuals at the ancient cemetery provides new information about the “genetic signature of people at a time and place we didn’t previously know much about,” said co-author Justin Tackney, an anthropologist at the University of Kansas. Jensen, Tackney and two others had their latest findings published in the American Journal of Physical Anthropology. “Ancient and modern human populations in Chukotka, as well as Canada and Greenland, have had a fair bit of genetic study, but for various reasons Alaska Native communities have not, outside of the Aleutians, the Alaska Peninsula, and southeastern Na-Dene speakers,” said Tackney. He said that much more is known about the archaeology than the genetics of the Thule people. “Our results indicate that the maternal genetic pool of the ancient population at Nuvuk matches that of the modern Inuit people and ancient Thule human remains sampled in Canada and Greenland. This supports archaeological theories that this is the correct time and location for the origin of the Thule people,” he said. The molecular analysis was performed on individuals who lived at various times from more than 100 years ago to more than 1,000 years ago, the study says. The tests took place on small rib fragments removed from the graves and analyzed at a lab in Utah, a procedure approved by leaders of Utqiagvik. Tackney said that the scientific literature about genetics of the peoples of the Arctic included a lot of information that had not been put together in context, a situation the authors sought to remedy. “By clarifying the reported data from almost 70 populations and thousands of people, we arrived at a better picture of which haplogroups (groups that share a common ancestor) are present where at what frequencies,” he said. He said, “I am comfortable saying that the genetic results now firmly support Thule origins on the North Slope,” though more genetic tests on older human remains would be needed to say where earlier Native populations came from. Columnist Dermot Cole can be reached at [email protected].